Bali is a small, tropical island in Indonesia, measuring about 90 by 50 miles (about 140 km by 80 km) in size. The island has two seasons, and enjoys an average ambient temperature of about 82˚F (28˚C). 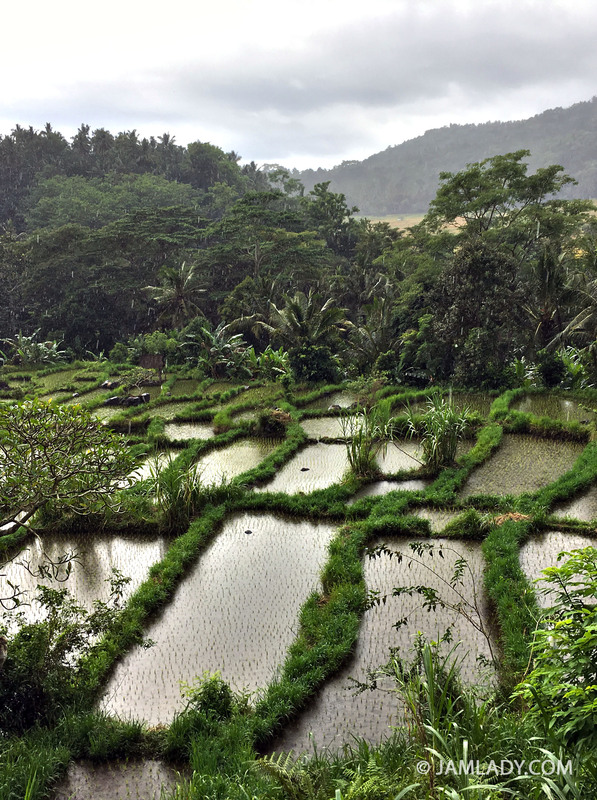 Bali lies about 8 degrees south of the equator, between the islands Java and Lombok, and is roughly 800 air miles from Australia. 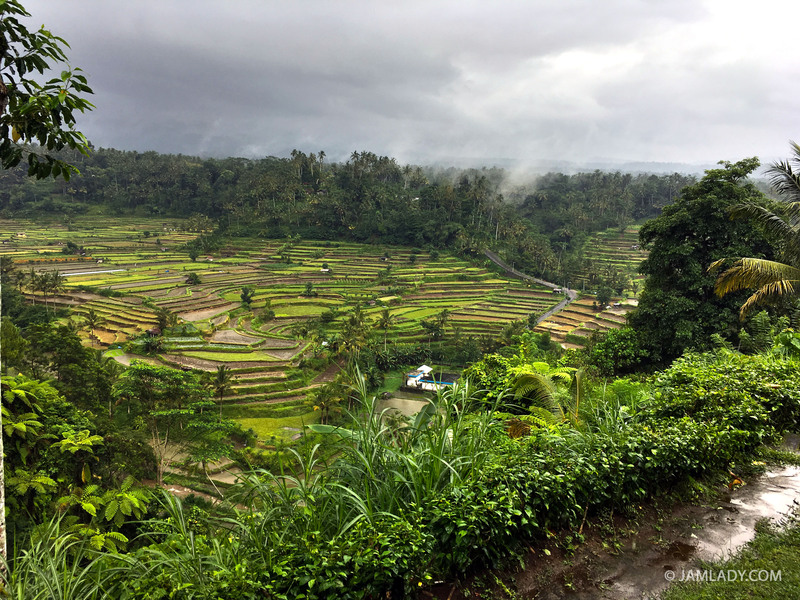 Bali has always attracted tourist due to its cultural and environmental lures, but recently ecotourism has begun to grow there. 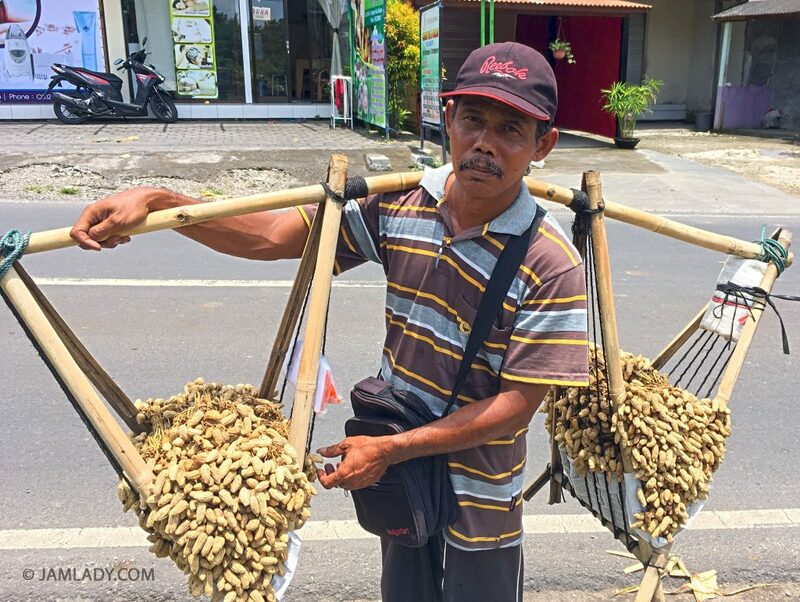 With Bali’s beauty, hot tropical weather, spiritual uniqueness, and friendly people, foreigners can’t help but be drawn to Bali. 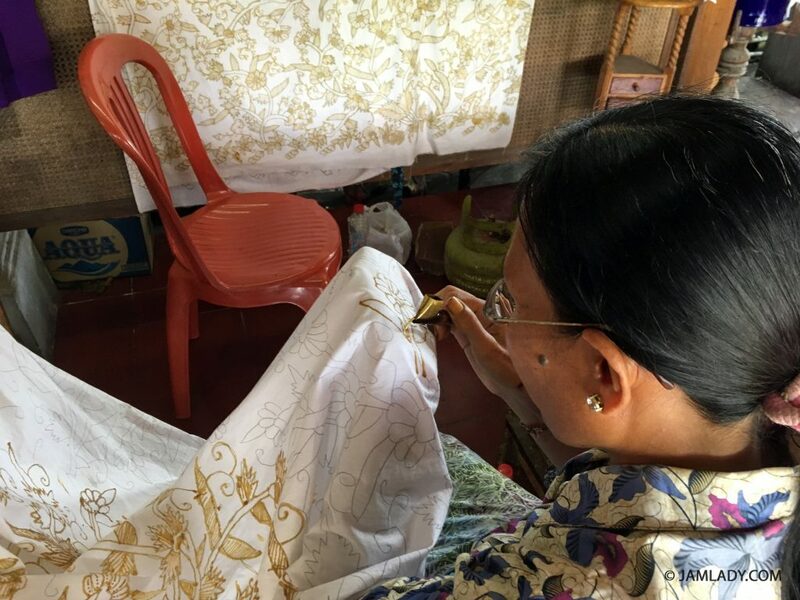 The locals live a spiritual life, thriving with their God-given gifts from the land and ocean, making daily flower and food offerings to their gods and by promoting a positive philosophy of kindness towards all. 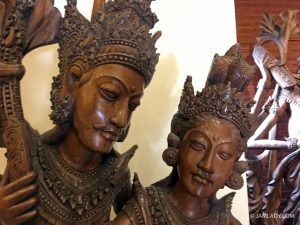 According to a 2010 census, 85.5% of Bali’s population practice Balinese Hinduism, with the rest adhering to Muslim, Christian, or Buddism religions. 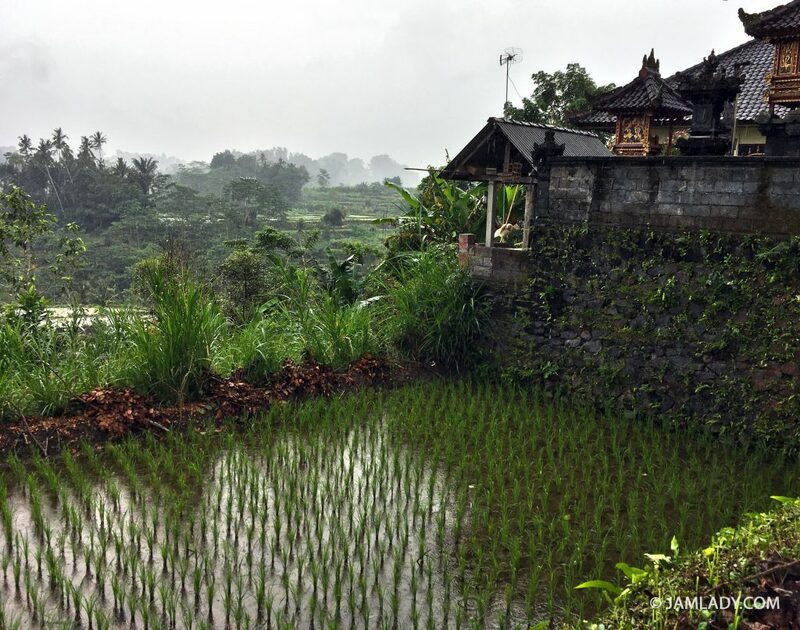 Tall, brown-black and moss-covered temples are ubiquitous features on the island, as is lava; the entire island is dotted with family and public temples juxtaposed between homes, terraced rice fields, fruit trees and bodies of water. Bali also has volcanos. The most important one, Gunung Agung, is still active and considered sacred by the local people. Many lava cutters can be seen about, cutting lava stone for temple construction. It is hard to appreciate the impact of so much religious adherence in belief and practice until you are there. Indeed, it is hard to take it all in when you are there. Bali is just a very special place. A car and driver can be hired for around $75–$85 a day, and is a good way to view the island at your own pace. 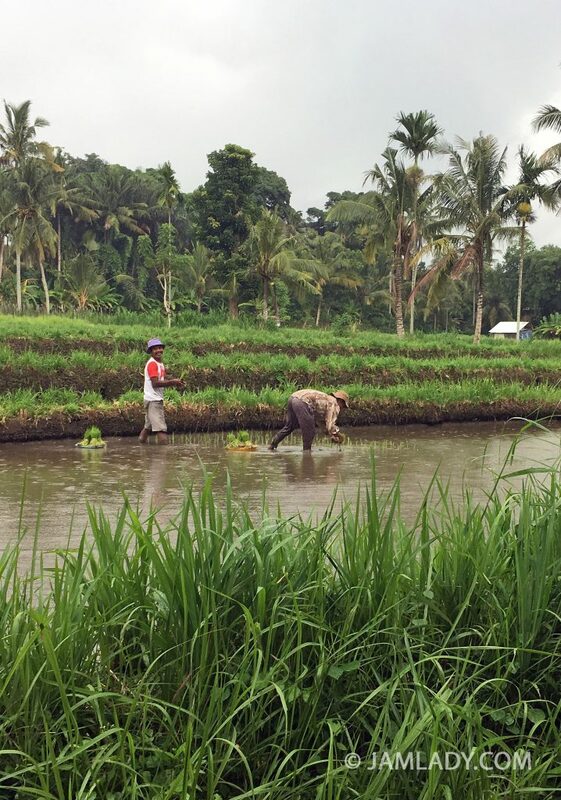 Crops grown there include sugar cane, coffee, copra (dried coconut meat), tobacco, fruits and vegetables. 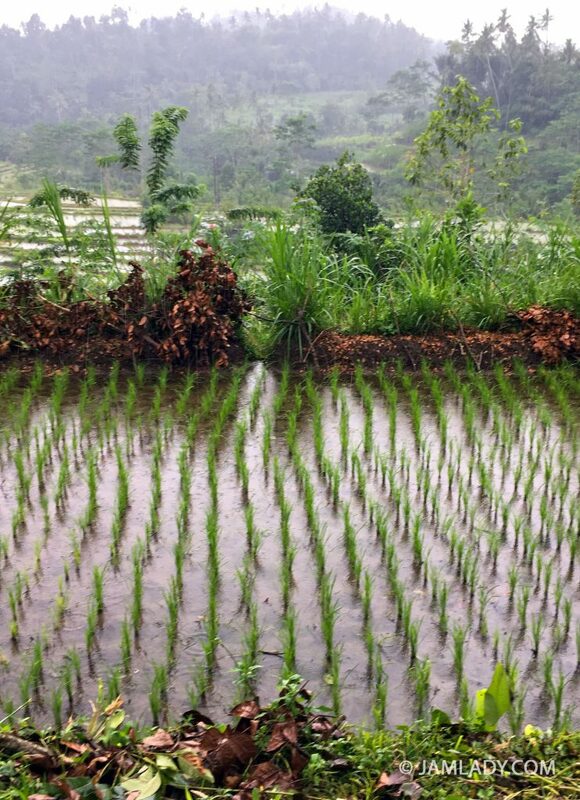 The rainy season runs from October to April, sustaining rice that needs five months to mature. Everywhere were chickens, cattle and hogs. 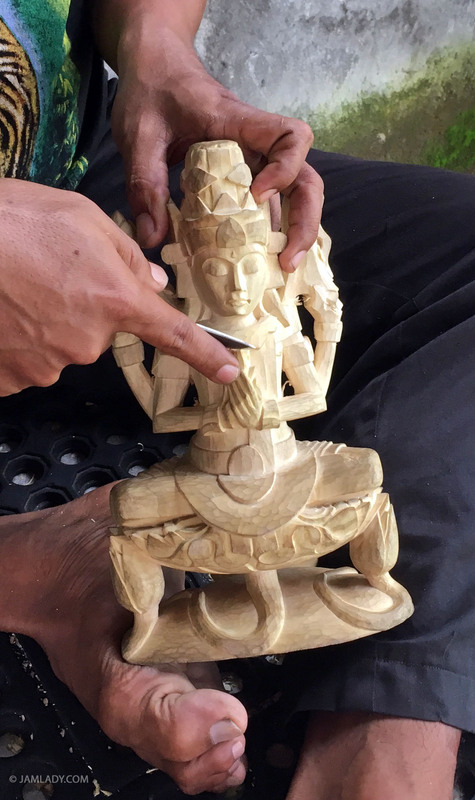 We visited batik artisans (Legong in Denpasar), fabric stores, the art town of Batuan which is famous for Batuan painting since the 1930s, several jewelry stores and extraordinarily talented wood carvers who were sitting on the ground, carving beautiful sculptures by hand (Mas Village, Ubud). We visited Kebune, Bali and Jl. Raya Uluwatu Badung, Bali, known for its agrotourism. This tourist attraction has walking trails for observing the different crops of coffee and other exotic plants they grow; they have a demonstration of how luwak coffee is made. Kebune is located fairly close to Uluwatu Temple (famous Hindu temple on a rock cliff) in Pecatu. 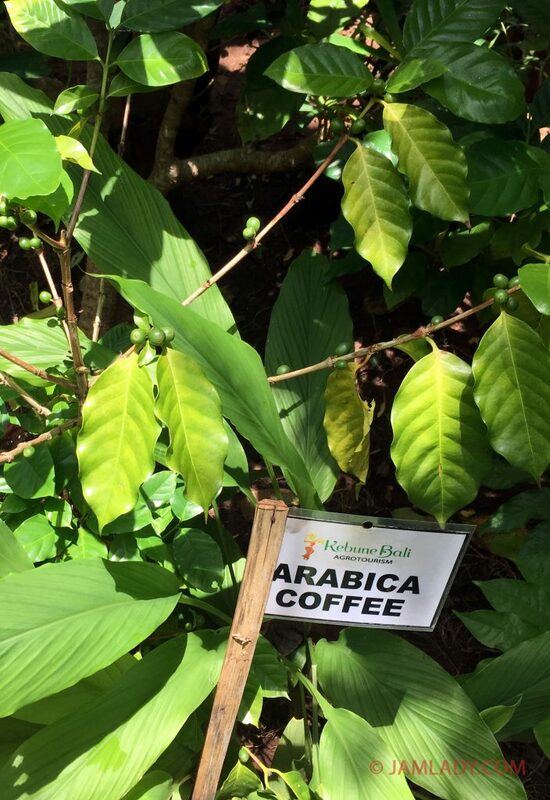 Their tasting session features many flavorful and medicinal teas, coffees, and chocolate. 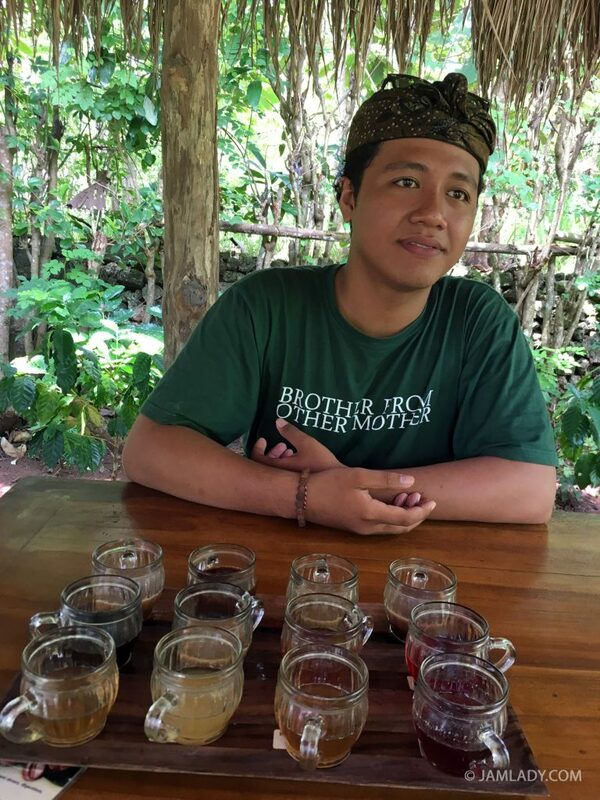 The offerings include: mangosteen peel tea (excellent), lemongrass tea, ginger tea, lemon tea, rosella tea, red ginger tea, ginseng with coffee, Bali coffee (Arabica), cocoa spice coffee, vanilla coffee, Bali chocolate, coconut coffee and luwak coffee. 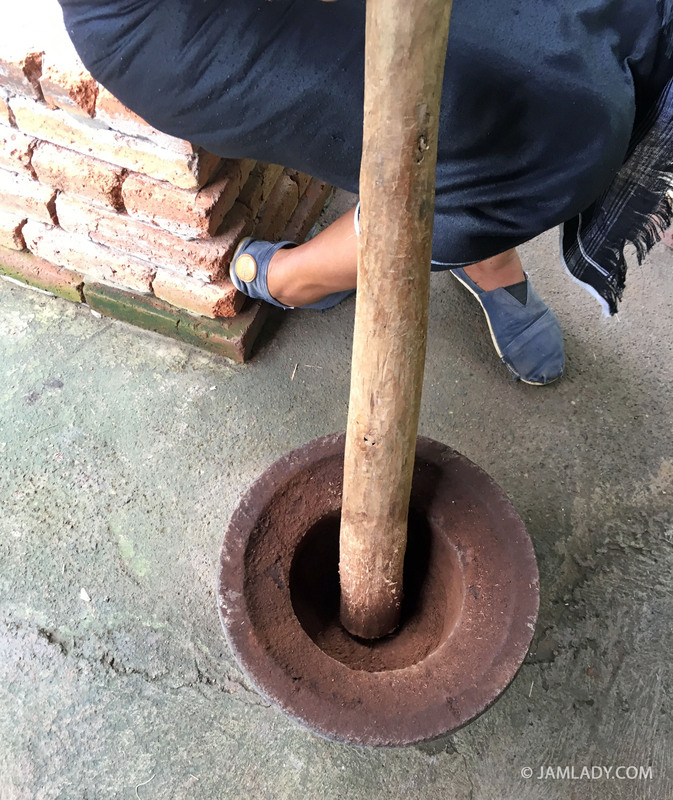 Their demonstration of the various steps for making luwak coffee was very interesting. 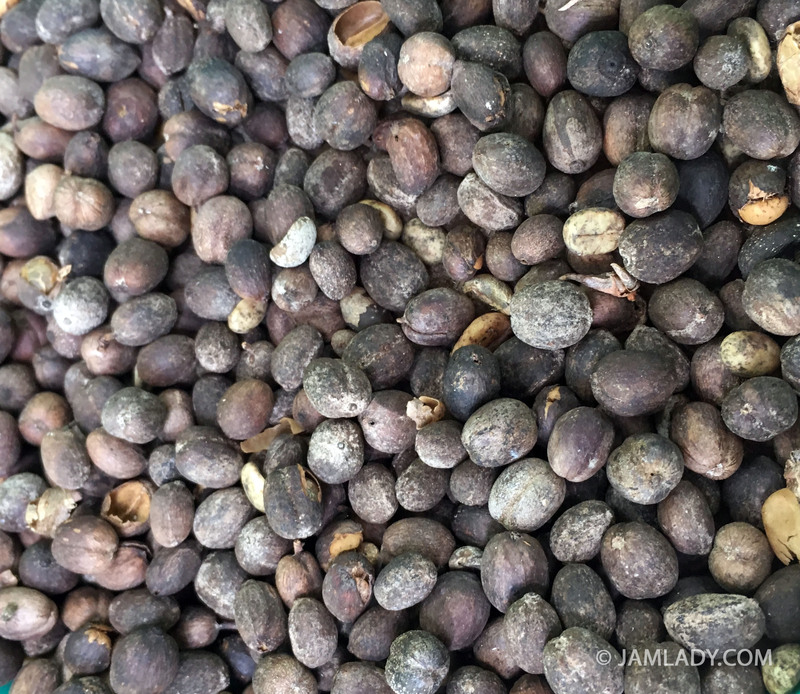 I found the information that mangosteen-peel can be dried and used to make tea, the most valuable information from this stop. Indeed, they sell mangosteen peel tea in their gift shop. 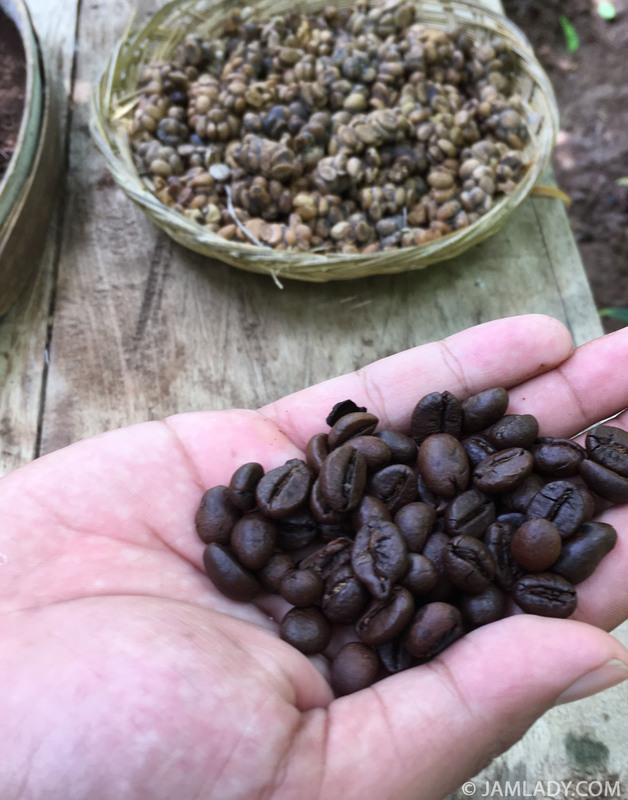 Kopi luwak, or civet coffee, comes from the Asian palm civet (Paradixyrys hermaphroditus). The civets select and eat fresh, ripe, coffee beans, thereby partly digesting and fermenting the beans which are defecated and collected by luwak coffee producers. 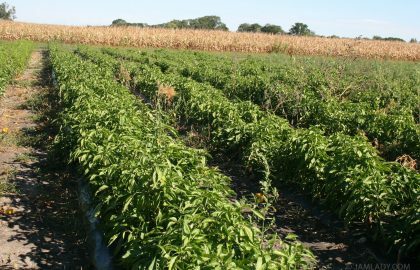 The protease enzymes in the civit’s digestive tract changes the beans, making shorter peptides and more free amino acids. Ostensibly this makes a better, less-acidic cup of coffee. I drank some. It tasted good, but wasn’t the best cup of coffee I ever had. 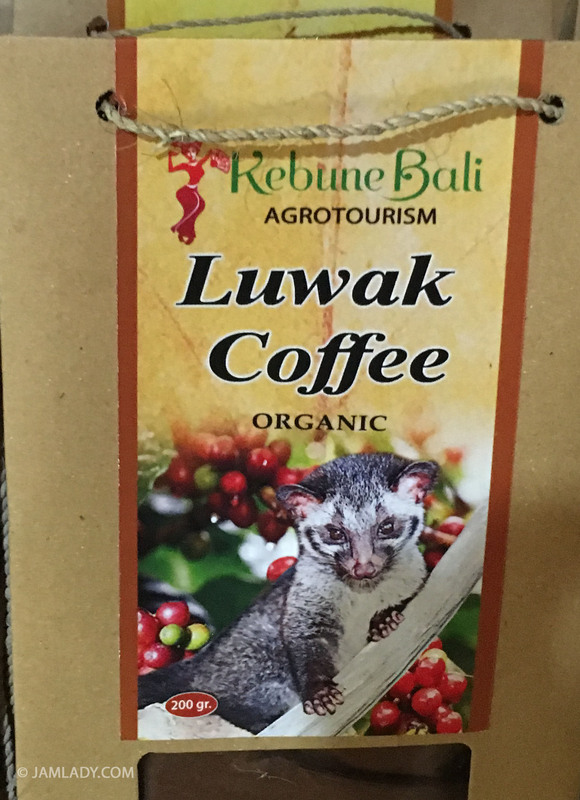 Also, there are other concerns and considerations with regard to luwak coffee production. 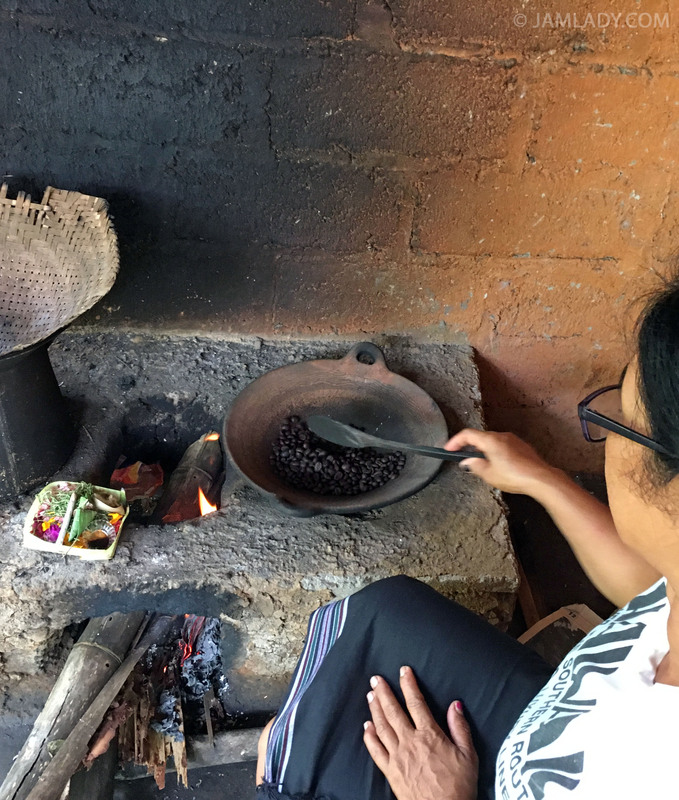 First is the very high purchase price of the beans in comparison to the quality of the coffee. 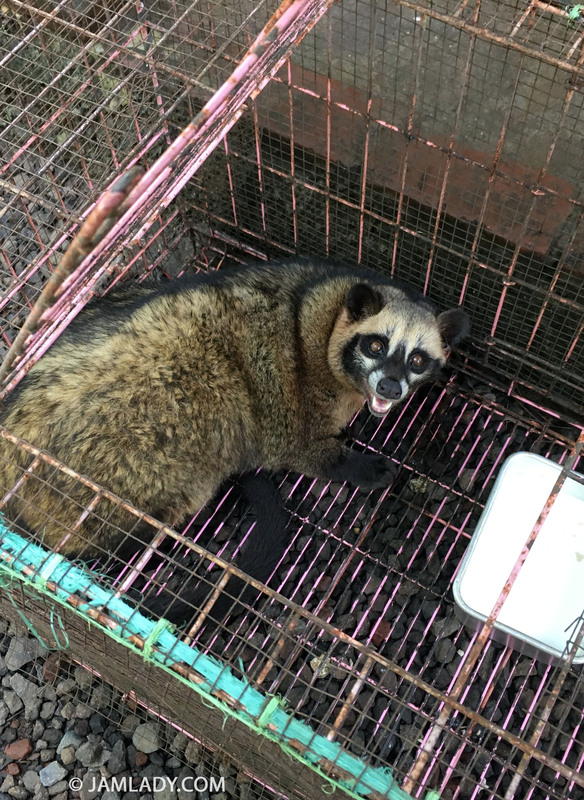 Second is the practice of force-feeding caged civets to get these special beans. 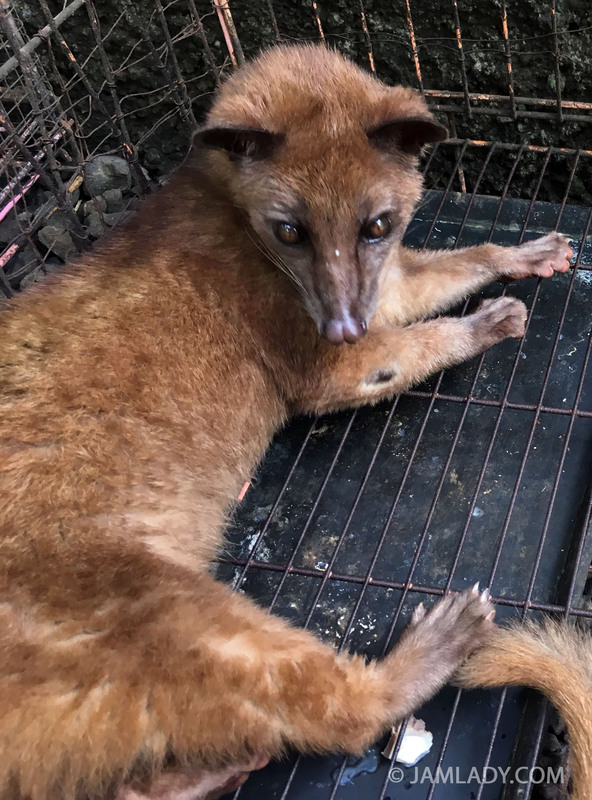 There were two caged civets at Kebune Bali, but the guide declared that they were only to display the animals for the buying public. 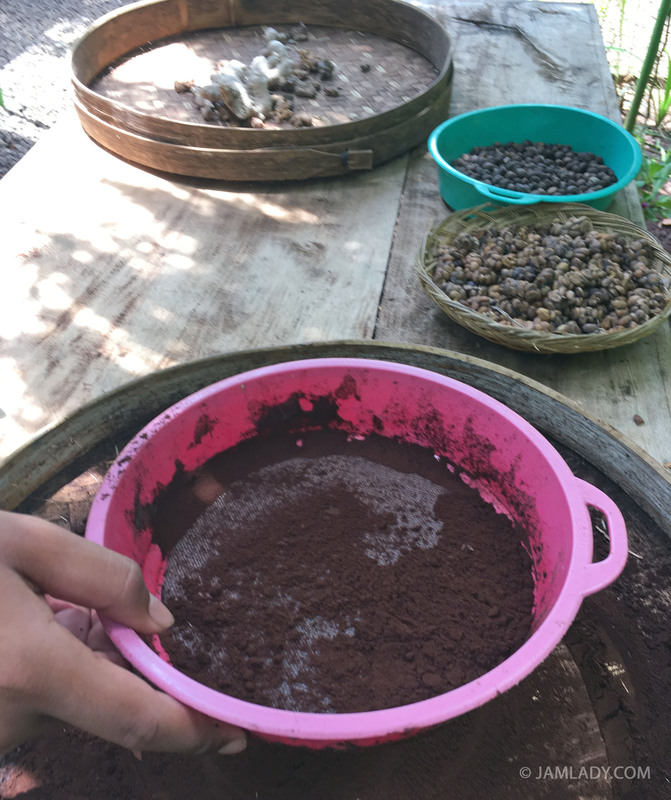 To obtain enough civet-processed beans to make any quantity of ground coffee, a producer (such as Kebune Bali) must collect civet excrement from the wild, from animals contained in fenced areas or keep animals in cages somewhere. 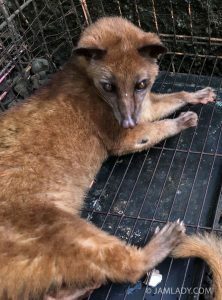 PETA and others advocating for civets argue: the caging of civets is cruel and force-feeding of non-civet-selected beans reduces the quality of the coffee and threatens wild civet populations. 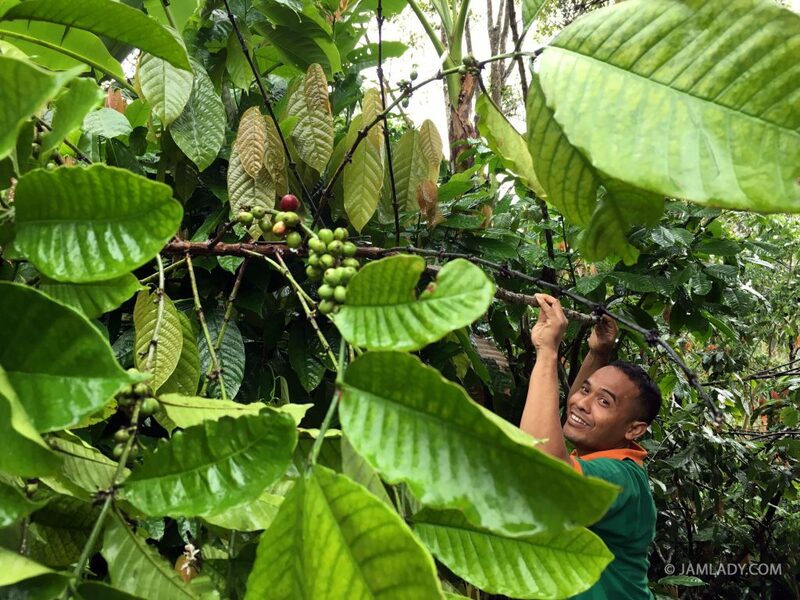 Historically, coffee production in Indonesia was established in the early 18th century by the Dutch in Java and Sumatra and they also brought Arabica coffee from Yemen to Indonesia, so there is a lot of coffee in Indonesia. 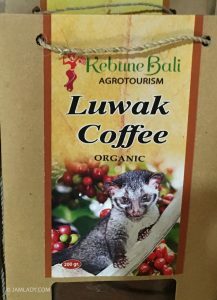 Today, kopi luwak is retailing for around $700 us per kilo, but prices may vary, especially civet coffee beans that are purchased from other producers in other countries such as the Philippines. Farmers markets are in many locations in Bali and many vendors line the main roads. 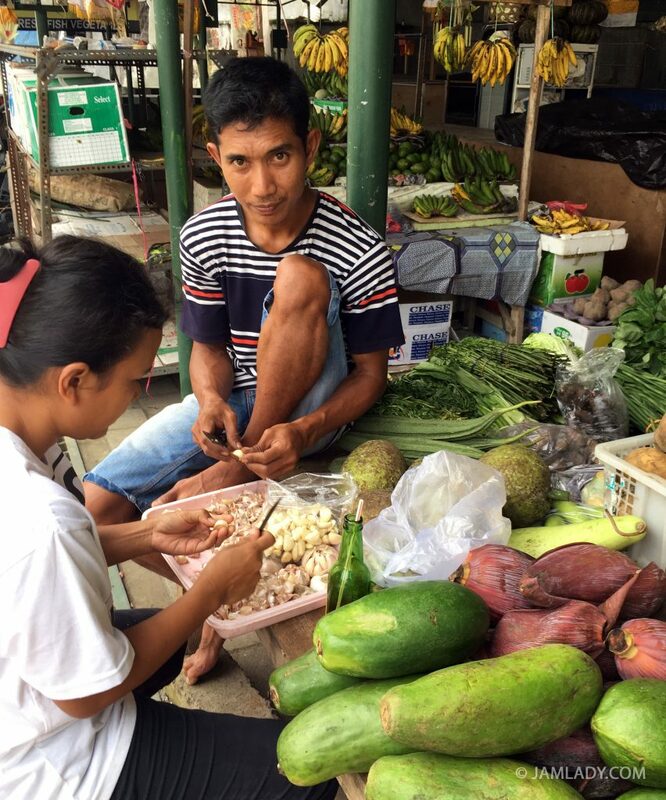 I attended a few and saw most of the vegetables that we know and a few that were uncommon. 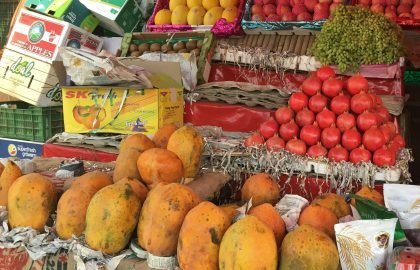 I will address this topic in further articles, as I have many beautiful market photos of different fruits and vegetables. There is also a chocolate museum in Singaraja, Bali which may interest some ecotravelers. 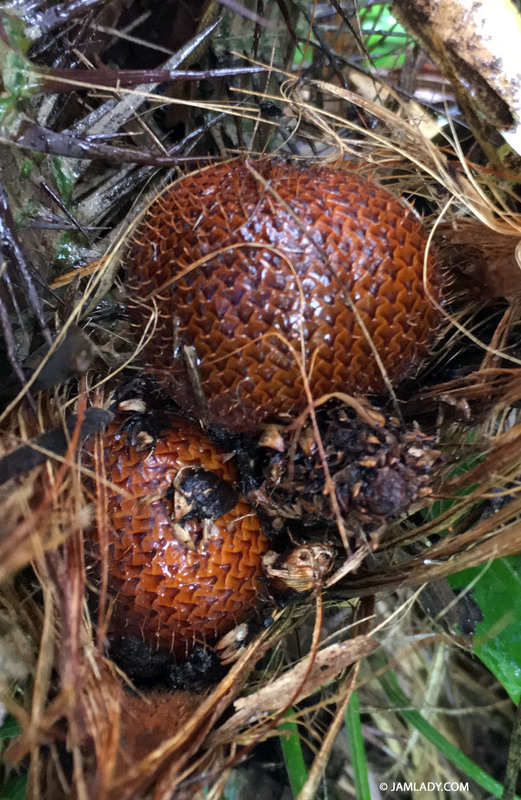 The snake fruit or salak is one of the more unusual agricultural products from Bali. Its name comes from the fact that the fruit’s exterior looks like a snake’s skin. 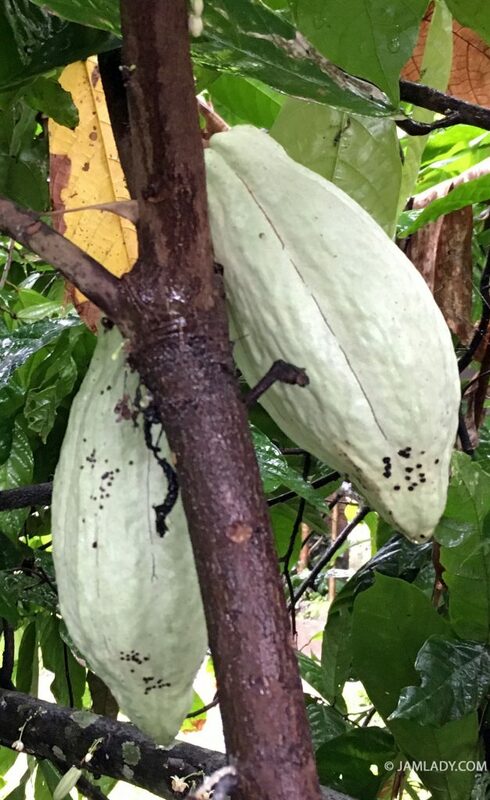 Watch for more on this fruit and other exotic fruits in future Jamlady articles.